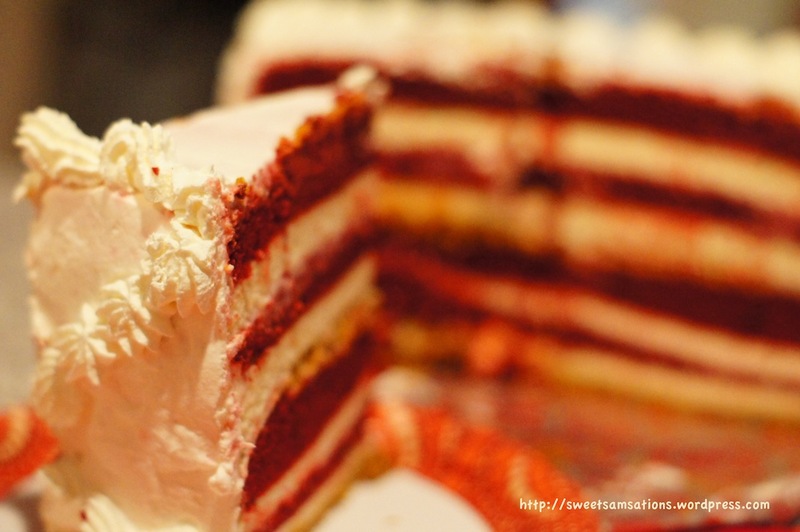 Here’s a picture of OLD Red Velvet Cake I had attempted last year but never got to blogging about it! Evidently, we know it is proof that the Americans know how to appreciate their desserts when they decide to introduce the Red Velvet CHEESECAKE at The Cheesecake Factory! Not sure who started the Red Velvet Cheesecake buzz but The Cheesecake Factory definitely did a good job popularizing it. I crave their cheesecakes whenever I go down to the States (mainly Seattle). Even if I didn’t request for The Cheesecake Factory, someone in the group will be sure to suggest it! And because they probably make one of the BEST cheesecakes in the world, it’s not hard to see why this franchise has become so popular. For my Singaporean / Malaysian readers, I would liken the Vancouver-Seattle trip to a Singapore-Malaysia trip. It is especially common for Vancouverites to head down just to get a car load full of groceries and to fill up on gas before driving back up. Who can resist 450g butter for only $3? Not to mention 450g Philadelphia cream cheese for under $5? I’m probably one of those guilty of buying at least 24 sticks of butter before returning to Vancouver. So anyways, it was Tracy‘s birthday!! I wanted to bake her a cake and knew she was a huge chocolate fan – specifically of the Red Velvet. Initially I wanted to layer it with cream cheese frosting, but fate had it that I saw a Cheesecake Factory plastic bag which led me to recall that “1500 calorie per slice” cake… mmm.. I vividly remember my first time biting into that decadent cake during a trip to San Fran. My thighs were screaming out to me, telling me to stop, but my hands couldn’t find the strength to resist. This one was a Cookie Dough Cheesecake. It’s been 2 years now, but I remember the cookie dough cake not being as good as the following Red Velvet we had that same day. I had such great memories of my SF trip 2 years ago!! But now it’s time to (attempt to) re-create this in my kitchen! I wanted a really tall cake with thinner layers, and so decided to make it 8 layers instead! If you do decide to make this, please ensure that you have read all the instructions before you attempt. The cakes may be made in advance and layered the next day. I made my Red Velvet the night before, and left the rest for the next day. From a recipe book: Country Living Great Cakes by Nancy Soriano. Preaheat the oven to 350 degrees F. Lightly coat 2 9-inch cake pans (or 4 if you have 4 available). Beat the butter and sugar in a large bowl using a mixer set on medium-high speed until light and fluffy – about 5 minutes. Add the egg yolks and continue to beat for 1 more minute. In a separate small bowl, stir the cocoa, food colouring and vanilla together. Reduce the mixer speed to low and beat in the cocoa mixture. Combine buttermilk and salt in a glass measuring cup. Add the flour by thirds, alternating with the buttermilk mixture and ending with the dry ingredients. Mix the baking soda and vinegar together in a cup and blend into the batter, beating until smooth. I’m not exactly sure why the baking soda and vinegar had to be blended in separately after everything else had been combined. Couldn’t the baking soda have been blended together with the flour and the vinegar with the buttermilk? Perhaps it was due to certain chemical reactions? Anyone knows? lol Well, at that time I didn’t want to risk the chance of a fail on my cake as that was the last of my buttermilk and I couldn’t afford the time to attempt another Red Velvet, so I followed everything as instructed… to the T! Bake for about 30 minutes (if in 2 pans, shorter if in 4 pans). 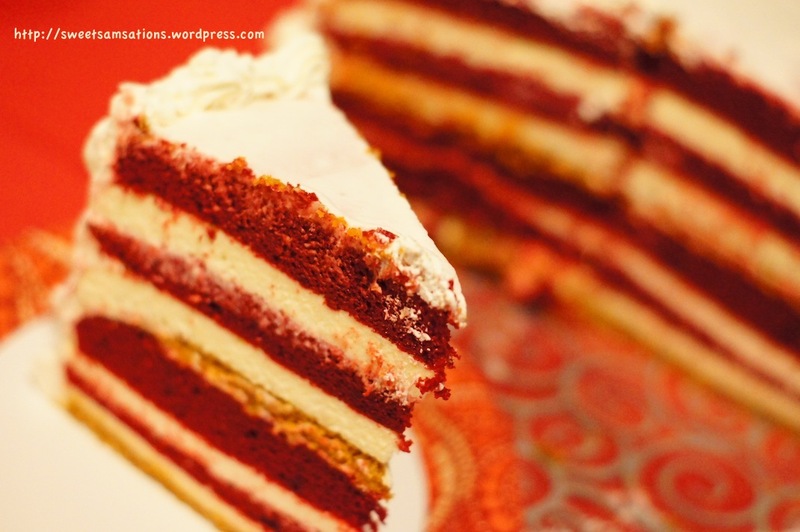 After the cake has cooled, use a serrated knife to horizontally slice both layers into 2. Prepare Crumb Crust: In a 9-inch springform pan, with fork, mix crumbs, melted butter, and sugar until crumbs are evenly moistened. Set a little less than half aside. With a measuring cup, press the remaining crumb mixture firmly onto bottom of pan. Bake 10 minutes; cool crust in pan on wire rack. Turn oven control to 300 degrees F. The bottom crumb layer should be thicker than the subsequent middle crumb layer. Prepare Cheesecake: In large bowl, with mixer at medium speed, beat cream cheese and sugar until smooth and fluffy. Beat in flour and vanilla until well combined. Reduce speed to low and add beaten eggs and egg yolk in, one at a time, beating well after each addition. Beat in milk just until blended. For the cheesecake, it’s almost impossible to slice it horizontally so I would definitely use 4 pans or 2 at a time. I did not use a springform pan for baking the cheesecake except for the first layer when it was baked onto the crust. I measured the volume of my batter before dividing them equally. Bake for about 30 minutes until set but still slightly jiggly and moist in center, and pale gold near edge. I didn’t want to use cream cheese frosting because the cake was already quite rich with cheesecake! Whipped cream frosting would provide subtler taste. Ensure your bowl and whisk have both been pre-refrigerated (cold) before. Beat the ingredients until stiff peaks form. Fill piping bag with whipped cream. Store the rest in the fridge while not using. I thought this was a neat idea and wanted to use it for my cake! I used a slightly different method from the book though. 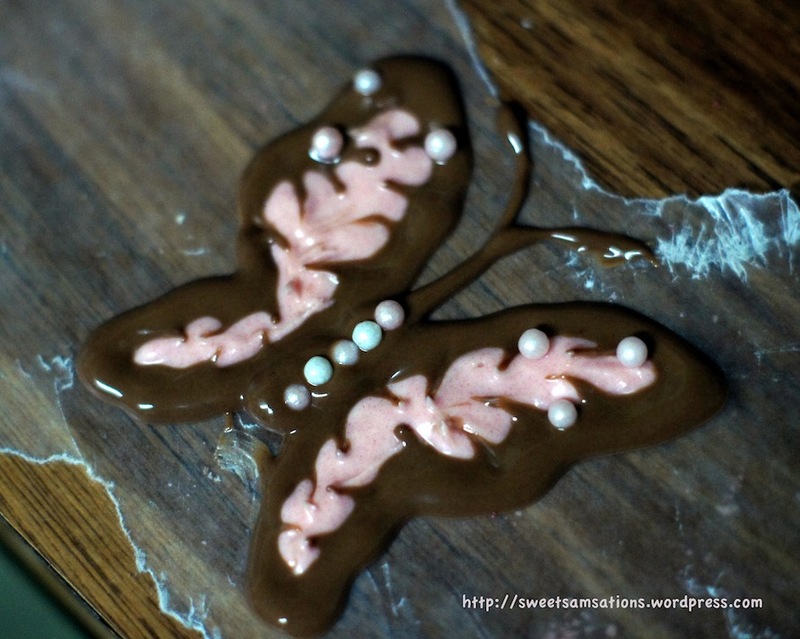 Draw a few templates of your butterfly on wax paper. Flip the paper around. Melt milk chocolate in microwave. Remove every 20 seconds to stir. When the chocolate has melted until smooth, fit into a ziploc bag and snip the corner. Pipe the outline of your template. Melt white chocolate chips using the same method. Add 1 or 2 drops of red colouring. You should end up with a pink colour. (Do not add too much colouring or your chocolate will seize and form an ugly gritty mass.) Fill in template with pink chocolate. Use a toothpick to pull a through the 2 colours from the outside toward the centre, to create a pattern. Add decorating sprinkles or pearls. Finally take a piece of cardboard and fold it in half. Place your butterfly on the cardboard and freeze till harden. 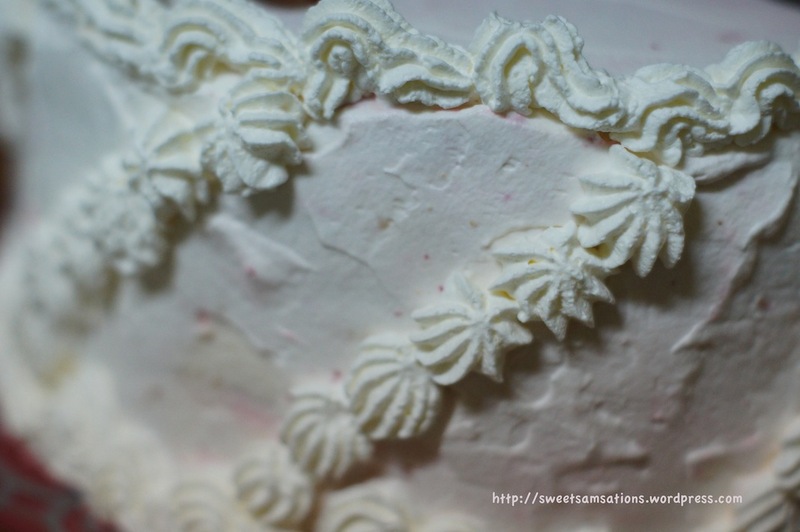 You could frost between the layers with a little bit of whipped cream if you like! I double frosted the cake. My first layer of frosting was to keep the crumbs in. The second layer was to smoothen it. Since a lot of frosting was being used, the more subtle tasting whipped cream was a better choice compared to the traditional rich cream cheese frosting. Transporting the cake was sooooo scary. I didn’t have a box big enough to contain it! I placed the cake on a cake board I made and then in an opened container. During the car ride, I was holding on to the cake as if my life depended on it. Every sharp turn we took sent my heart to panic. If you think this cake probably took up a lot of time, you thought right! It pretty much took me about 12 hours for the entire process, especially because I didn’t have enough pans to multi-task and didn’t exactly plan very well ahead! Happy Birthday Tracy!! Love youuu!! Tracy and her guests enjoyed my cake! It was a gigantically tall cake though! So I reminded Tracy to cut smaller slices, since this was double the size of a regular cake! P.S. I’d like to apologize that the lighting / photography for this cake wasn’t the best! 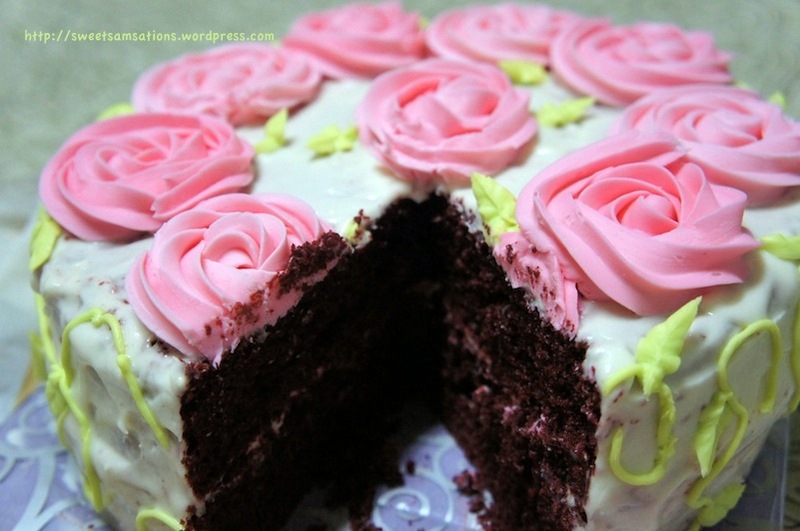 By the time the cake was completed, it was already getting dark – no natural lighting. This time, I didn’t get to stage and style at the comfort of my home either. Although I was disappointed with my uneven layers, I’m glad this cake was a success! 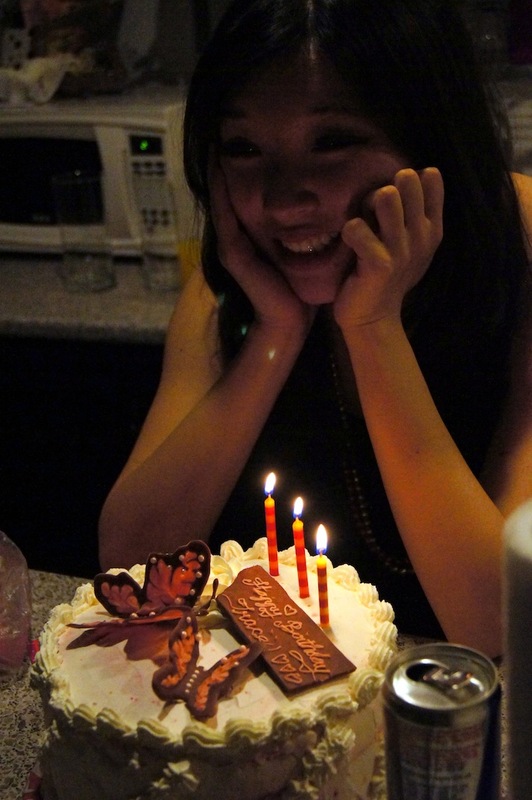 I loved the red velvet sponge cake! I thought the cheesecake was a little too rich though, but nevertheless complemented the red velvet quite well. I would try another cheesecake recipe in the future. But the red velvet was perfect! And of course, the butterflies got lots of compliments too! Everyone kept asking me how I made them. lol. Alright!! That’s all for now! 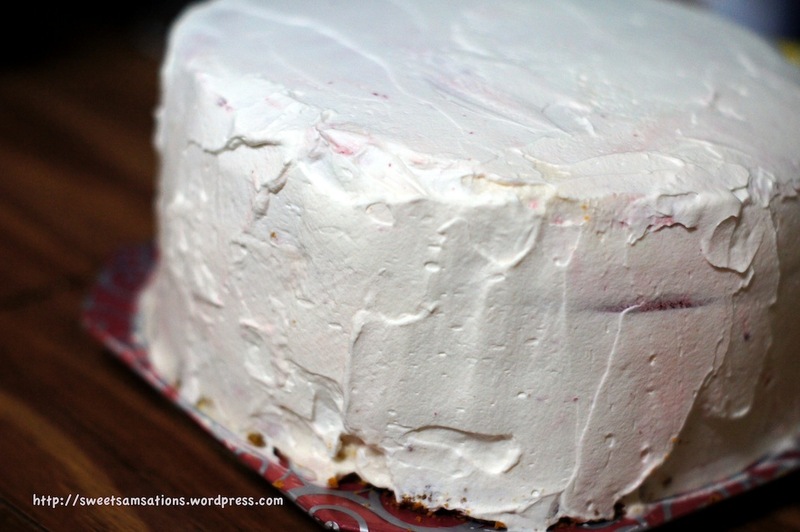 I’m also submitting this post to Aspiring Bakers #18: Layers of Love (April 2012), a “Layered Cake” event I’m hosting this month! Please check it out if you’d be interested in participating too!! The cake looks exquisite! First Prize! Oh…my…gosh…so I read your post, and now I’m going to forget that I ever read it so I’m never tempted to make it! Looks amazing! Wow. You really really love your friend. That cake was a total labor of love! I adore cakes with lotsa little layers. And I love cheesecake. But I would like for you to put the smackdown on the Cheesecake Factory because homemade is always sooooo much better. And your cheesecake is prettier. And they are overpriced. Also they have taken over the desserts at Starbucks. I hope someone makes me a cake like this for my birthday! I did! Thanks Robert! She definitely was!! Fantastic presentation, especially love the butterfly’s you added! I am also curious about the timing of the vinegar/baking soda combination. Is red velvet the only cake that adds the duo? Thank you Sandra!! haha.. Those butterflies took forever to make and I was so worried that I would accidentally smudge them while working at them. Yeah, I haven’t used vinegar very much in making cakes, only pies! So I’m not sure! But according to Wikipedia, “the reaction of acidic vinegar and buttermilk tends to better reveal the red anthocyanin in the cocoa”. So I guess the vinegar caused its redness. As for baking soda, I remember making a Jalapeno Cornbread before. In the recipe, Chef John explained that he preferred baking soda over baking powder when added to buttermilk because baking powder tends to give an aftertaste when mixed in. But yeah still no idea why they had to be added only at the end! hahaha..
Wow! That really is a labour of love! If there was a cake Olympics you would have my vote indefinitely! 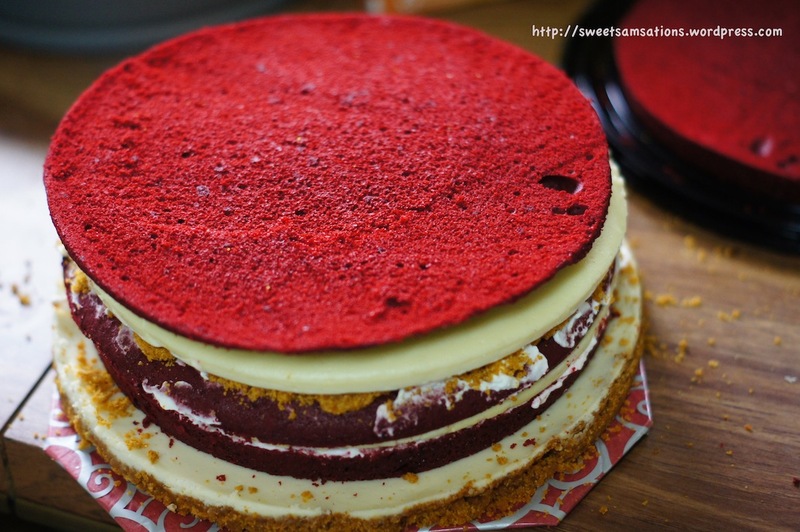 What an amazing friend you are making an incredible 8 layer red velvet masterpiece for your friend! Congrats on a very successful venture! Awww that is such a sweet comment!! Thank you!! I was so worried it wouldn’t turn out well or tasted too sweet! It was so hard to predict the success of cakes especially when it’s not like you can stick your fork in to try and then give it to the b’day girl later! hahaha. Pheww! WOw.. Tracy is definitely feeling the layers of love from this! And definitely worth the 1500 calories a slice! Oh my goodness what an amazing cake! 😮 It looks every bit worth the considerable effort too! wow, I am gobsmacked! You are so brave 🙂 I have given you an award …. Very ambitious of you to undertake such a detailed cake for your friend. However, the effort was well worth it. The cake looks fabulous-you did such an amazing job on the layers as well as the decorating! Besides the fact it is a real stunner, I imagine it was as delicious as it looks. 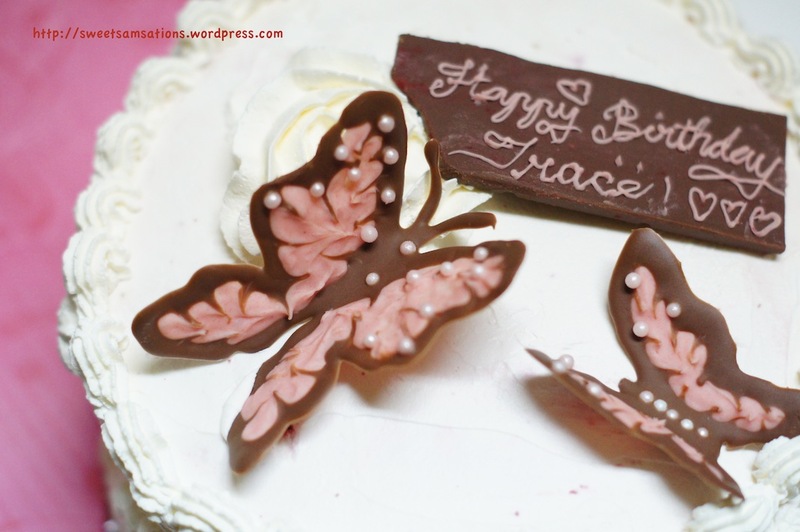 Happy birthday to Tracy-very lucky to have a sweet friend like you with a talent for cakes! Thanks Tina!!! awww! I’m happy to have Tracy too! We’ve been through so much together during our college years! haha.. Thanks for your sweet comment! That was some project!!!!! Glad your cake arrived at its destination safely. Your masterpiece is just stunning, congratulations!!!!! haha. I know!! When I realized the cake couldn’t fit into any box, my eyes widened and I just stared blankly at the cake, thinking… omg.. what do I do now?!?! lol It was raining that day too! So phew… Glad it arrived safe and sound and the cheesecake had enough time to chill in the fridge! oh my goodness, this looks soooo good. i’m so impressed – this is one of the nicest homemade cakes i’ve ever seen. nicely done! Aww! Thanks Amy!! haha.. Still a lot I need to learn about cake making, slowly but surely! Thank you! What a fantastic friend you are, that cake is awesome! Gorgeous cake! Thank you Carol!! 🙂 hehe Yeah, I’m glad she really liked it! This is so beautiful – if I wasn’t sick I’d be buying a plane ticket to visit that cake! Love how detailed you are in explaining it – I am sometimes afraid to bake but you make it seem so accessible. So sweetly accessible. Kudos! Have a lovely holiday weekend. 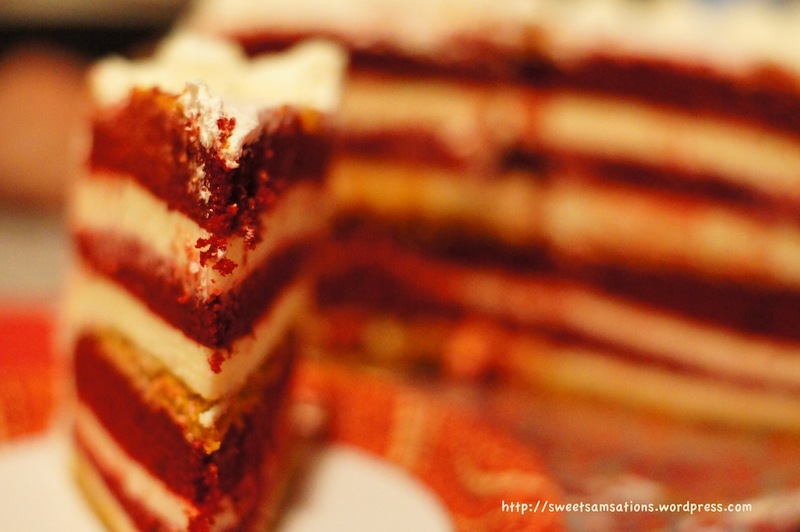 I was thinking of making a red velvet cake a while back, but I don’t have white vinegar! I wasn’t sure if it was a mandatory ingredient, and I didn’t want to buy a whole bottle of vinegar just for that 1 tsp… What to do? Wow, you are just incredible! 8 layers sounds unbelievably good. That cake is just exquisite!! And you are a real sweetheart to have baked it for your friend. How sweet. Thank you Asmita!! Your sweet comments always make me smile! Aww!! Thanks Bam!! hehehe.. Yeah! I was really glad she was jumping when she saw the cake! 😀 Ahhh! Yes! I was reading wikipedia on how the vinegar gives the red too! But couldn’t figure out why it had to be added only at the end. Thanks Bam!!! Take care too! Thanks for your comment and support Jasline!! I’m very egg-cited to see your cake! Oh yes, and Happy Easter to you! lol. This is INSANE! I would marry you for this cake. EIGHT LAYERS? You’re one great friend!!! I also love the red velvet cheesecake at TCF! Happy Easter Sammie!! oh yes yes!! 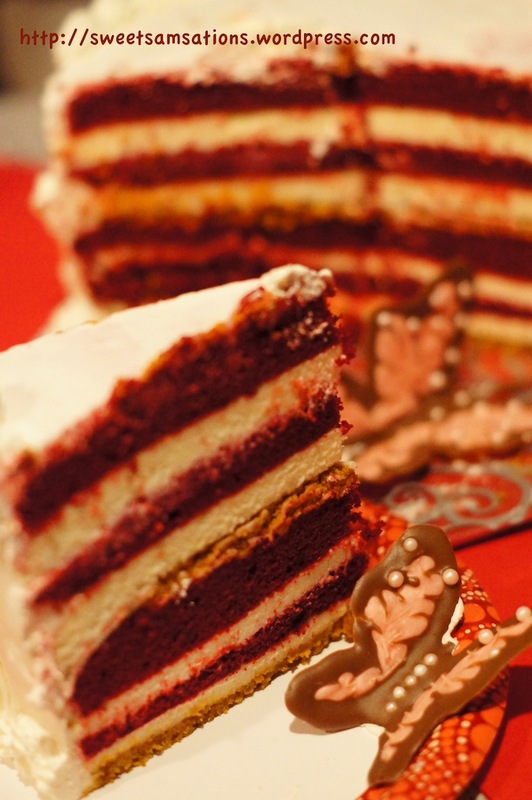 Do a triple-layered Red Velvet! Will turn out very pretty and delicious especially with the cream cheese! Wow thats an awesome cake! I want to have that on my Birthday too! I don’t really get the hype surrounding red velvet cakes. But yours turned out so yummy!!! That is a work of art! Love the butterfly garnishes, too. You are such a good friend to make your gal pal such a treat. All these layers just makes you not to want to stop! You found a great way to make your friend happy. i would be very happy if someone dedicated so much time and effort to make something like this. Looks delicious! Thank you Lisa!!! Hope all is well! Sending lots of love! xoxo! I think we need to become friends. I would think I died and gone to heaven if someone brought me that gorgeous cake. I love red velvet and yet claim to be a fairly natural eater. That red dye somehow sneaks past my fake food alert radar and I eat it with wild abandon. 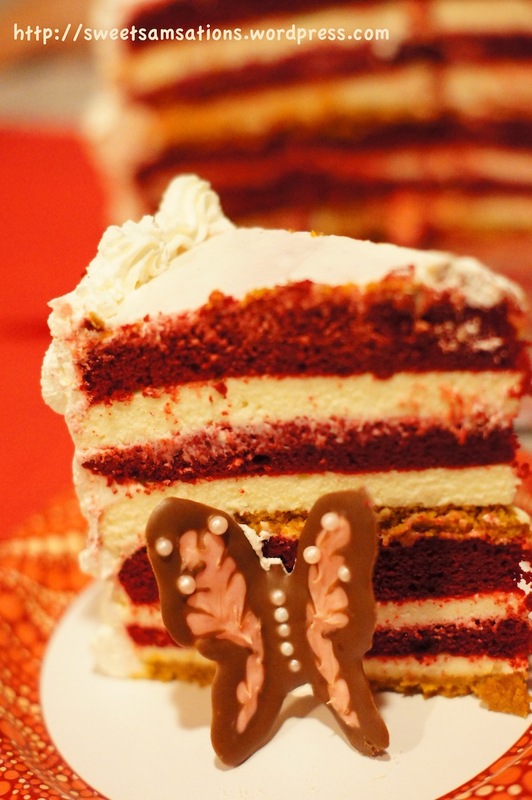 Your cake is so amazing…and so are those butterflies! Thanks for this post and hope you are having a great week! Oh my goodness!!! Talk about talent. The cake looks soooooo scrumptious. Well done Sam!